Until only recently, the application of connectors in switch cabinets required substantial effort that could not be avoided. Pre-assembled cable harnesses and connector parts must be inserted from the inside of the switch cabinet into a bulkhead mounted housing attached to the inner wall of the cabinet. This can be a rather complex challenge. 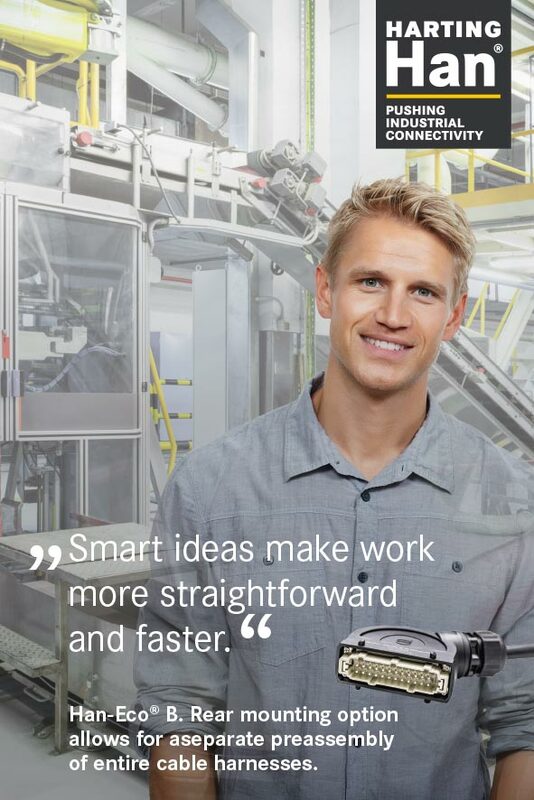 But no more: The new connectors of the Han-Eco® B series provide valuable time advantages for equipment using the Han® B industry standard. For installation, both ends of the cable harnesses can be rear-mounted from the inside of the switch cabinet into the bulkhead-mounted housing. The rear mounting option considerably simplifies the assembly of cabinets and therefore saves time and money. The switch cabinet units and the cable harnesses can be pre-assembled separately. This allows for the work to be divided up in a more optimal way; processes can even be outsourced, if necessary in order to facilitate even more efficiency and therefore increase productivity. In addition to monoblocs for Han®B, the Han-Modular® range can also be used in a plug-compatible fashion in the new Han-Eco®. The hinged frame allows the modules to be integrated into the plastic hood or housing. As a result, this considerably increases the application possibilities for plastic housings in manufacturing. Further advantages result from the plug-compatibility of the Han-Eco® B with standard metal Han® B housings. Thus, combining plastic and metal hoods and housings does not imply any time-loss when it comes to system conversion. Parallel use is also possible, since both variants can be integrated homogenously into your production equipment. This makes it easier to respond with a flexible solution to customer demands. You can also continue to use existing testing facilities, since they fit both material versions; there is no need for changes or additional effort.